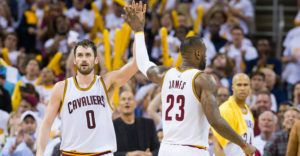 Just as he did last year, Cleveland Cavaliers superstar LeBron James will host a pre-camp workout at the University of California-Santa Barbara campus for several of his teammates. According to a report from Joe Vardon of cleveland.com, Isaiah Thomas, Cleveland’s newly-acquired All Star point guard, will be joining James on Tuesday for the training sessions. Thomas, now 28 years of age, was traded to the Cavs in one of the bigger deals of the 2017 NBA offseason. The Cavs, winners of last season’s Eastern Conference crown, sent Kyrie Irving, who asked for a trade shortly after the conclusion of the 2016-17 season, to the Boston Celtics. In return, the Celtics gave up Thomas, Jae Crowder, Ante Zizic, the Brooklyn Nets’ unprotected first round pick in next year’s Draft, and the Miami Heat’s second round selection in 2020. On Monday, James and Kevin Love spent some time together in the gym at UCLA. Vardon also reports that Cavaliers guard J.R. Smith, who was not able to attend James’ pre-camp workout session last year due to contract negotiations, has been in Los Angeles since Friday. With the start of the season approaching fast, it seems the time to lock in is now.